A beautiful old oak door leads into a double lounge/ dining room with sofas and doors opening out onto the terraces. 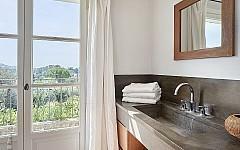 Separate laundry with washing machine, tumble dryer and sink. 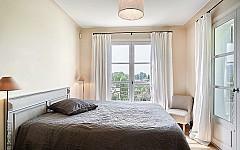 Master bedroom: double bed (1x180cm) views over the garden and swimming pool. Plasma television, Ipod dock and dressing room. Private terrace. Ensuite bathroom with bath, double washbasin shower and toilet. Dressing room. Bedroom 2: double bed (160cm) views over the garden and terrace. Ensuite bathroom with rainshower washbasin and toilet. Bedroom 3: single beds (2x90cm) ensuite bathroom with bath, toilet and wahsbasin. Bedroom 4: double bed(1x160cm) with sliding doors opening onto the swimming pool. Ensuite bathroom with shower, toilet and washbasin. Bedroom 5: 2 X single beds ensuite bathroom with shower, washbasin and toilet. 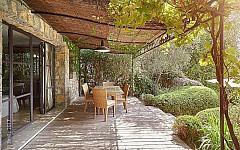 Situated on the east side of Mougins close to the tennis club and 5 minutes drive to the village centre. Cannes can be reached in 15 minutes and Nice Airport is a 40 minute drive away.